The grudge between Afia Schwarzenegger and Deloris Frimpong Manso has been ongoing for years now with jabs being directed at each other, whether indirect or subliminal. 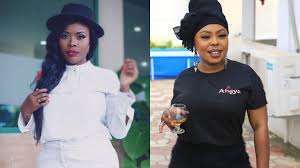 According to the popular Ghanaian comedienne and TV host, Afia Schwarzenegger her onetime friend Delay was “nil” when she met her in 2006. Afia revealed that; “I had my own car, I was even the one funding the “Presenters Guild” production in 2006 and I was happily married to my dead Ex-husband. When I met Delay I was the CEO of Dolphy Music production, I was the first person to buy Quata’s song, I carry money in my car booth to sort out payola”, the Atigya host told Abeiku Santana on Atuu. She disclosed that Delay was below the standard of friends she used to hang out with. “When I met Delay she had no fancy dresses, she was always in spaghetti shirt and trousers, she can curse herself if she defends it, she even said girls who wear sleeveless tops are prostitutes”, Afia noted. “Everyone has a humble beginning but Delay was bad, my friends always quizzed why I walked with her because she didn’t have any level of swag. Regardless of everything, I believed in her because she was strong-minded and had great vision, she was hilarious like me so I liked her so much”, She added. Afia further on stated; “The night before our first shooting for the Afia Schwar series, Delay held my hand and told me, “Moda don’t let recognition get into your head for our beautiful friendship to break because we’ve come too far. I have seen it all, I use to wash Delay’s dresses, I cook and clean before she goes to work, I was more like a house girl, I came to stay with her because my husband died in South Africa and all my inheritance were sold cheaply, it was just by the grace of God I survived”. The relationship between Afia and Delay has gone sour and from all indications, there is no way the two are coming back as friends.